Most of us have heard that salmon contains omega 3 oils–a very good thing for your body. Maybe less of us know the specific benefits but we eat it anyway believing in its mystical healthy powers. If that’s all you ever know about it, that’s okay. If you’re sticking to wild-caught salmon and consume it once or twice a week then that’s probably as technical as you need to get. However, if you’re going to enjoy that beneficial oil from that yummy buttery fish you need to know one more critical piece of info. You should not sear or cook with high heat this delicate fish containing polyunsaturated oils. Why? You just may end up destroying the molecular structure of those oh-so-healthy omega 3 oils so our body won’t be able to metabolize it and put it to good use. Polyunsaturated fats compared to the hardy, sturdy and stable saturated fats do not fare well when exposed to heat (nor light or oxygen). So how should we cook this supremely healthy fish to help deliver its exceptional omega 3 oils to our brain, nervous system and heart where it’s going to do tremendous good? Steaming is my favourite method although poaching works well too. Sous vide is apparently an absolutely wonderful way of cooking it evenly and flavourfully at a constant temperature but I have yet to try this method. You can also cook it in the oven if it’s done at low heat, say 350 degrees or less. Now if you want to get a little geeky with me for a bit you might like to hear about a few specific studies showing salmon’s fine benefits for the brain and it’s optimal health. If supplements are not your style, consume wild fish like salmon 2 to 3 times per week. And here’s the twist. This recipe is not about the muchly touted Wild Salmon. Let’s change it up and use Black Cod also high in Omega 3s–nearly as much as salmon. (6) Although you can use this marinade for Wild-Caught Salmon too. And now finally the recipe–cooked at a low temp in the oven. No searing here!! 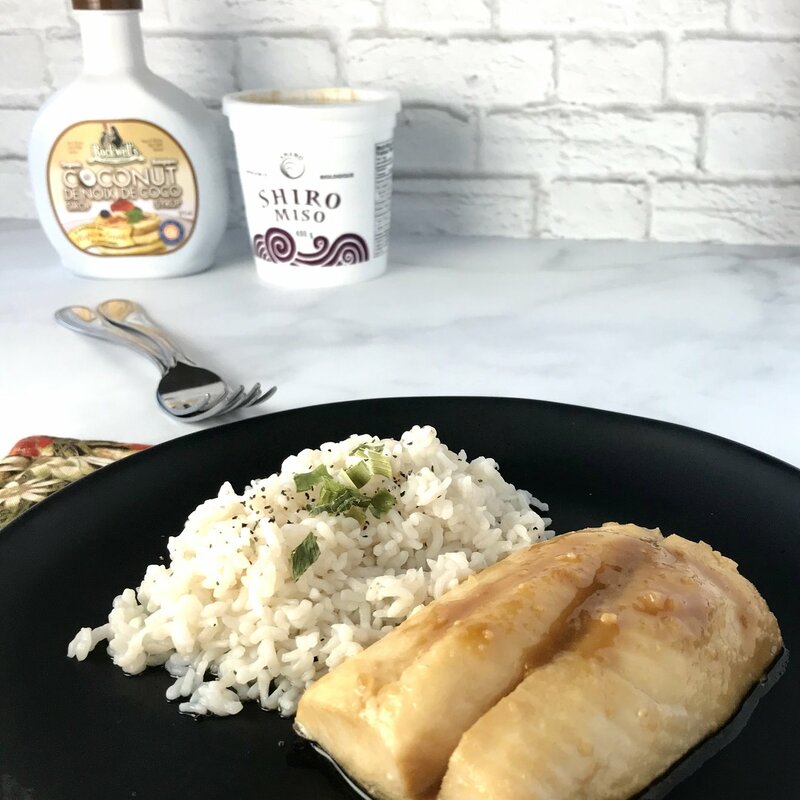 Wild Salmon gets top billing when it comes to Omega 3 fats but when your taste buds yearn for a different flavor, try Black Cod (not related to Cod). Its buttery flavor paired with this sweet miso glaze is a delicious and nutritional highlight any night of the week. Step 8 -serve with love and enjoy! Kiecolt-Glaser, Janice K., et al. “Omega-3 Supplementation Lowers Inflammation and Anxiety in Medical Students: A Randomized Controlled Trial.” Brain, Behavior, and Immunity, vol. 25, no. 8, 2011, pp. 1725–1734., doi:10.1016/j.bbi.2011.07.229. Howe, Peter R. C., et al. “Effects of Long Chain Omega-3 Polyunsaturated Fatty Acids on Brain Function in Mildly Hypertensive Older Adults.” Nutrients, vol. 10, no. 10, Feb. 2018, p. 1413., doi:10.3390/nu10101413. Schuchardt, Jan Philipp, and Andreas Hahn. “Impact of Long-Chain Polyunsaturated Fatty Acids on Cognitive and Mental Development.” Omega-6/3 Fatty Acids, July 2012, pp. 103–147., doi:10.1007/978-1-62703-215-5_8. Li, Fang, et al. “Fish Consumption and Risk of Depression: a Meta-Analysis.” Journal of Epidemiology and Community Health, vol. 70, no. 3, Oct. 2015, pp. 299–304., doi:10.1136/jech-2015-206278. Alaska Fisheries Science Center. “MESA: Sablefish Nutrition & Value.” National, 30 Jan. 2008, www.afsc.noaa.gov/ABL/MESA/mesa_sa_sable_nv.htm.